Rocks are made of minerals. Only a few minerals are rock forming and most rock is made from a combination of the commonest of these such as feldspars, quartz, mica, olivine, calcite, pyroxene and amphiboles. Most other minerals, of which there are over 3000 different types, are rarely present in quantities large enough to be considered rock forming. Minerals are made of elements. Elements are simple substances that cannot be broken down into any other substance. The name of an element is written down as a combination of letters called a symbol, eg: sodium is Na; chlorine is Cl. Salt, a combination of sodium and chlorine is thus written as a formula symbol NaCl. 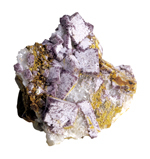 Many minerals are made up of large numbers of elements, so their formulas are complex. 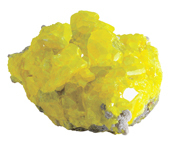 The most common minerals are those based on silicon and oxygen, Si04. 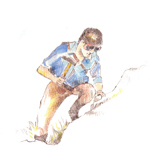 People value and search for minerals for many different reasons. Most are useful as they are the raw materials of the metals we manufacture into goods. The lead in a pencil is the mineral graphite mixed with clay. Precious metals are used in commerce and other minerals are valued as gems. Minerals are either found in shapeless lumps which we call ‘massive’ or they can form into the special shapes we recognise as crystals. Most minerals form within the spaces between other minerals and grow into rough shapeless masses. However, if they are able to form freely in a hole or cavity in the surrounding rock the mineral takes the form of a crystal and these crystal lined cavities are called geodes, vugs or pockets.